When Anguel & I first started dating, we were working intense corporate jobs that regularly kept us at the office past dinner. Most nights involved take out food eaten in the company of colleagues (or alone), so it’s safe to say that dinners at home were particularly special. When we first moved in together, we made a version of this salad to celebrate. It was by no means fancy, but it had a short ingredient list, came together quickly and tasted far better than any salad we’d had at a restaurant. We were hooked. And now, six years later, we’re still in love with it. In fact, we even served this Pea & Pesto Spinach Salad at our wedding! For such a simple dish, we’re honestly so surprised by how crazy people went for it. We hesitated to share the recipe on the blog for the longest time, because it kind of feels like a non-recipe recipe. But, after a lot of post-wedding pestering from friends and family, we figured it was only fair to share it all with you too. 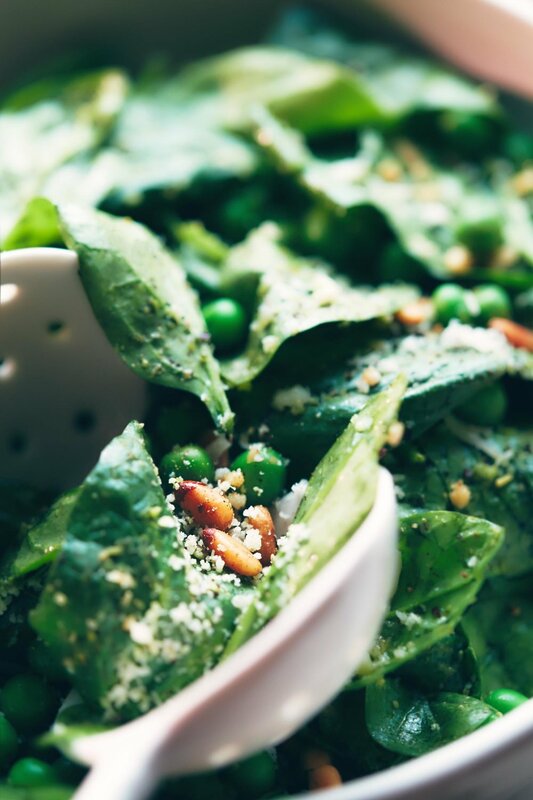 The basics of this salad are exactly what the name implies: peas, pesto and spinach. We gravitate towards this salad on busy weeks, when all we have time for is a five minute trip to the grocery store. All you need to do is grab a box of pre-washed baby spinach, a bag of frozen peas (if you don’t already have some sitting at the bottom of your freezer), and a few other pesto-related ingredients and you’re off to the races. It’s also the kind of impressive salad you can make for guests, and they’ll have no clue how easy it was for you to whip up. In fact, it kind of feels like cheating. When we first started out making this salad, we relied on store-bought pesto for the dressing. And if you’re in a pinch, there’s no shame in going this route. But, if we’re being honest, the homemade pesto dressing below is definitely our favorite way to enjoy this salad. Over the years we’ve found it to be the best balance of fresh basil flavor, salt, acid - and not to mention, most reliable when you make it yourself, since store-bought brands vary significantly. To make assembly happen even faster, you can make the Fresh Pesto Dressing a day in advance. If you are making the pesto dressing in advance, we’d recommend squeezing a bit of extra fresh lemon juice just before serving. It’s a simple trick that helps wake up flavors of something that’s been sitting in the fridge. You’d be surprised how much lemon juice (or acid more generally) helps give even a store-bought sauce a little extra boost. Just a heads up: Fresh basil is prone to oxidation, so if you make the dressing in advance, don’t be scared if the top layer of the dressing looks darker after sitting in the fridge overnight. Simply give it a quick stir and you’re good to go. It still tastes great. To minimize the darkening effect, you can also place a piece of plastic wrap directly on top of the sauce, before sealing it a jar or airtight container. The plastic wrap will minimize the sauce’s exposure to air, which will further reduce discoloring. This salad is vegetarian (see note below on cheeses, including how some might not actually be vegetarian-friendly!). For a vegan option, we’ve included recipe notes on how to alter the pesto dressing to be dairy-free, without needing to hunt down any specialty vegan cheeses. If you do have a favorite vegan parmesan cheese substitute, you can try subbing it 1:1. Begin by toasting pine nuts over medium-low heat. You will need a total of 6 tablespoons for both the sauce and the salad. Stir regularly to prevent the pine nuts from burning, and remove from heat when they’re golden brown (approximately 1-3 minutes). Add 3 tablespoons of toasted pine nuts to a food processor, and set aside the remaining 3 tablespoons for garnish. Defrost the peas by adding the frozen peas to a medium sized bowl filled with lukewarm water. Set aside. Now, make the fresh pesto dressing. 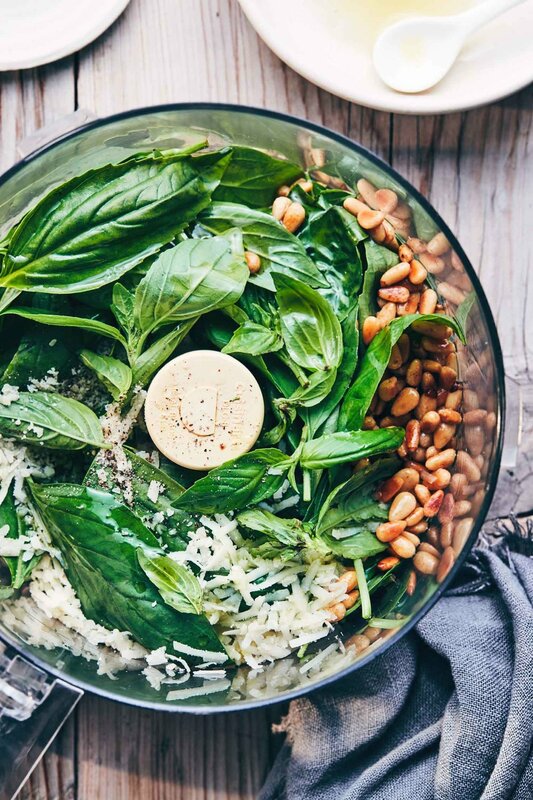 To the pine nuts, add fresh basil leaves, olive oil, cheese (if using), fresh lemon juice, garlic clove, salt and pepper in the food processor. Blend until a smooth paste forms. Strain the green peas and shake to remove excess water. Add defrosted peas to a large serving bowl, alongside spinach. Add the fresh pesto dressing, then toss to coat leaves evenly. Top with the remaining toasted pine nuts, and grated cheese (if using). Serve immediately. -For a vegan option, omit the hard Italian cheese from both the Fresh Pesto Dressing and the salad garnish. Add 1/8 teaspoon of extra salt and 1/2 teaspoon nutritional yeast to the Fresh Pesto Dressing. This mimics the saltiness and cheesiness flavor of dairy-based cheese. -*Imported Parmesan cheese is not technically vegetarian since it contains animal-based rennet. For a vegetarian substitute, look for hard Italian cheeses that are either labelled as “vegetarian friendly” or list “microbial enzymes” instead of rennet. We use Asiago cheese for this recipe. Of course, if you prefer parmesan, that works too. -**If you don’t want to make your own Pesto Dressing, you can substitute with 3/4 cup store-bought pesto sauce, with 1-2 tablespoons fresh lemon juice added to taste. Pre-made pesto varies significantly by brand, so you may also need to add extra salt & pepper. If making the Fresh Pesto Dressing the day ahead, you may wish to squeeze in a bit of extra fresh lemon juice just before serving, to help wake up the flavors again. -***We find that the large 4 oz / 112 g pre-packaged bags of fresh basil yield 1 1/2 cups (or 70 g) of basil leaves, once separated from their stems. Discard any stems, you will not need them for this recipe.